Deny, deny, deny—it’s the standard playbook in politics for fending off unwelcome accusations and has been used expertly by the Communist Party of China (CCP) on a wide range of issues for as long as anyone has been keeping count. But for one set of truly damning allegations—that the regime and its subordinates have harvested tens of thousands of organs from prisoners of conscience, who are guilty of no crime, for vast profit—even denial was seen as giving too much credence. In that case, the strategy since 2006 was either to outright ignore the claims and mounting piles of evidence or to spread propaganda about the individuals making the arguments. But recently, for the first time, there seems to be a slight modulation of that strategy: from silence to actual denial. This new propaganda strategy seemed to creep out in a recent article published in China Medical Tribune, a semi-official publication for China’s medical community. 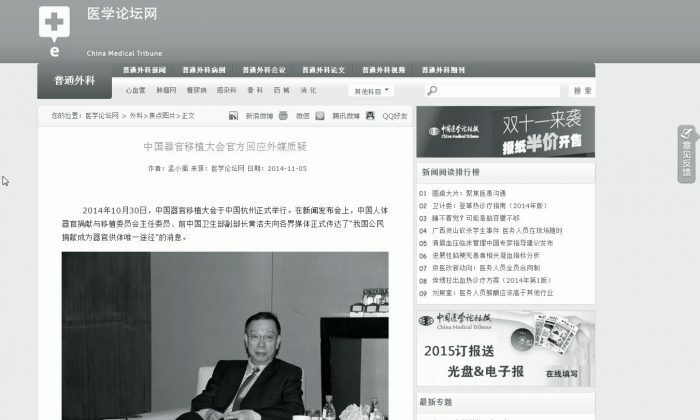 Titled “China Organ Transplant Assembly Officially Responds to Foreign Media Suspicions,” the article makes prominent reference—including with a large screenshot—to a report published by Minghui, a well-known website associated with Falun Gong adherents. Minghui is most notable for its extensive first-hand reports by Falun Gong practitioners about the persecution of the discipline in China. Falun Gong is a traditional Chinese spiritual practice that has been persecuted in China since 1999. 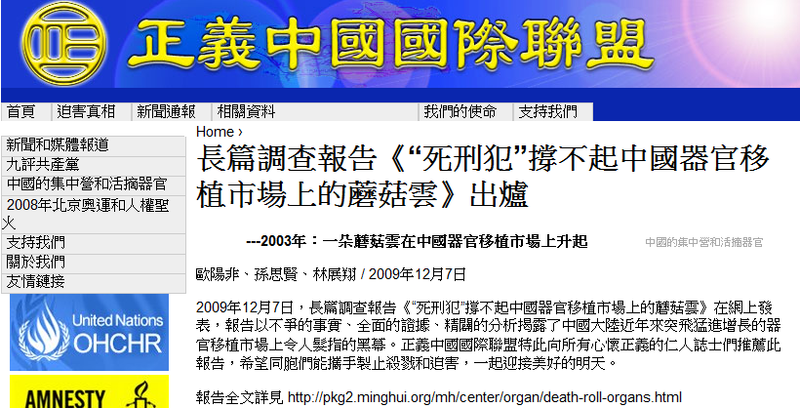 The Chinese publication refers to a detailed report by Minghui in 2009 that concluded that Falun Gong prisoners of conscience must have been a major source for Chinese organ transplants, given that death-row prisoners were far too few. It even includes the link, still active, to the report. In 2006, allegations first emerged that Chinese military hospitals were using Falun Gong practitioners as a live organ bank: taking blood samples and killing victims for organs on order. These allegations were first made in 2006 by two Canadian researchers in a report titled Bloody Harvest, which pointed to the ultra-short wait times (just weeks) for organs—something that takes years in countries with volunteer-based donation systems. Among other pieces of evidence, Chinese doctors and nurses were also found to have admitted, in surreptitiously recorded phone calls, to using the organs from Falun Gong prisoners. Evidence has continued to mount, and the United Nations, European Union, U.S. Congress, and medical organizations and human rights groups have called on Chinese authorities to explain themselves. All along, Chinese authorities have only dared to attack the investigators or claim that the allegations are part of an unexplained Falun Gong plot to undermine the reputation of the Communist Party. “Reactionary propaganda” was the term of art used by Party propagandists to dismiss the detailed allegations, which were often based on simple analyses of Chinese publications. Never before has an officially linked publication made prominent reference to the allegations—if even to deny them. “My view of this is that the concern about the abuse has been coming from too many directions for the Chinese Communist Party to ignore,” wrote David Matas, a co-author of the seminal report on organ harvesting from Falun Gong, in an email. “So, instead of pretending that the concern about the abuse does not exist, they have shifted to denying the abuse. “Denying, rather than ignoring, criticism does have the downside of giving publicity to the criticism, which is what we are now seeing. If the criticism is little known, silence is often the best strategy,” Matas continued. “However, if the criticism is already widely known, then silence serves no purpose. “The Chinese communist authorities must have come to the conclusion that the knowledge of the killing of Falun Gong for their organs has become so widespread that they have less to lose by denying it than by ignoring it,” he wrote. Negative attention by the international transplant community may have helped to force the CCP’s hand. Although it did not refer to harvesting from prisoners of conscience, The Transplantation Society, the pre-eminent medical group representing transplant professionals globally, wrote a letter directly to Communist Party leader Xi Jinping earlier this year saying in effect that the Chinese authorities had broken their promises on organ transplant reform because they were still harvesting organs from death-row prisoners. Doctors Against Forced Organ Harvesting (DAFOH), a medical advocacy group based in Washington, D.C., had previously cautioned Western surgeons from participating in Chinese transplant events and therefore conveying legitimacy upon them. “We would consider it unethical for any foreign transplant professional to attend this transplant congress in Hangzhou given the rampant and unrepentant transplant abuse in China, unless the person is going with the express and sole purpose of speaking out against it,” DAFOH wrote in a statement on its website. Dr. Torsten Trey, DAFOH’s executive director, said in a telephone interview that the recent report was suggestive. He referred in particular to a cryptic remark by Huang Jiefu, who said it was “not yet the time” for international inspections of Chinese organ harvesting practices. Huang is China’s former vice minister of health and the point person for dealing with the international community on China’s organ transplantation system. “Why is it not yet the time? It suggests that inspections would find something if they take place now,” Trey said.